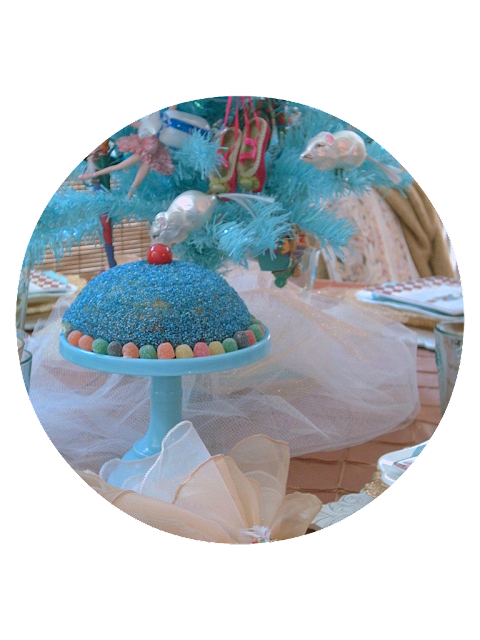 The small blue tree that is the centerpiece picks up the colors in all the plates, as they each feature blues in their colorway. The ornaments I have had for years. 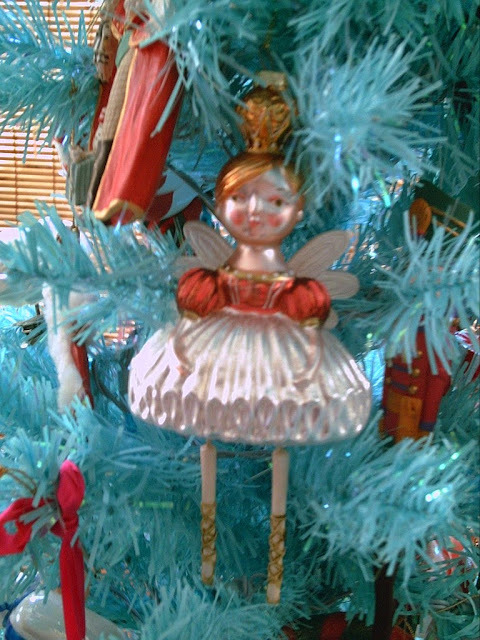 We used to decorate a tall 10' tree with a Nutcracker theme. 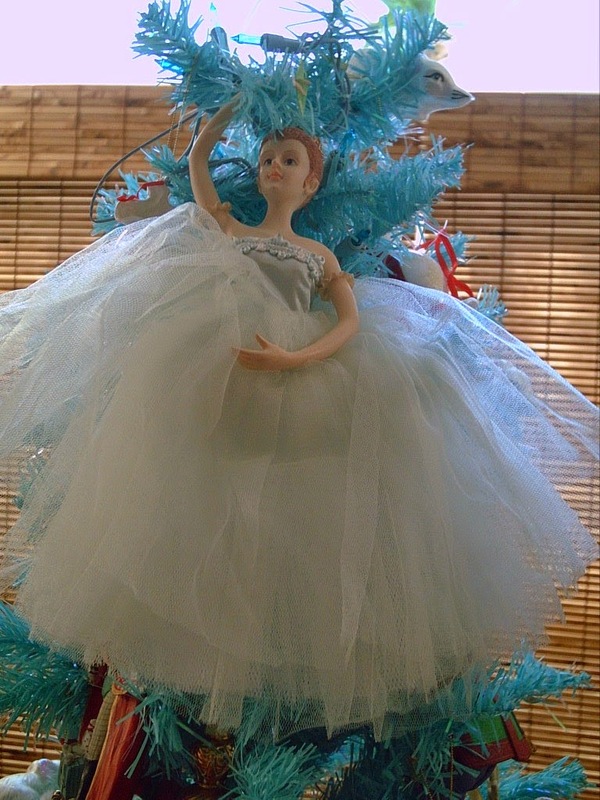 So I used a few of those ornaments for this tree. 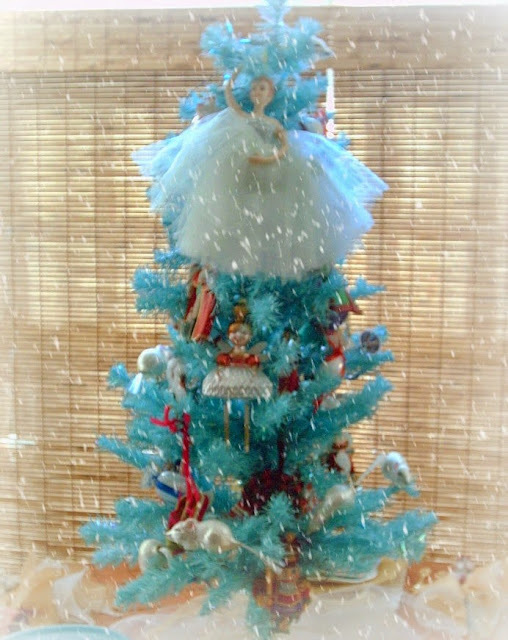 I didn't load the tree with a lot of ornaments as I wanted each ornament to stand out. The second plate in the set is of the Nutcracker himself. He also has a coordinating Christmas cracker. 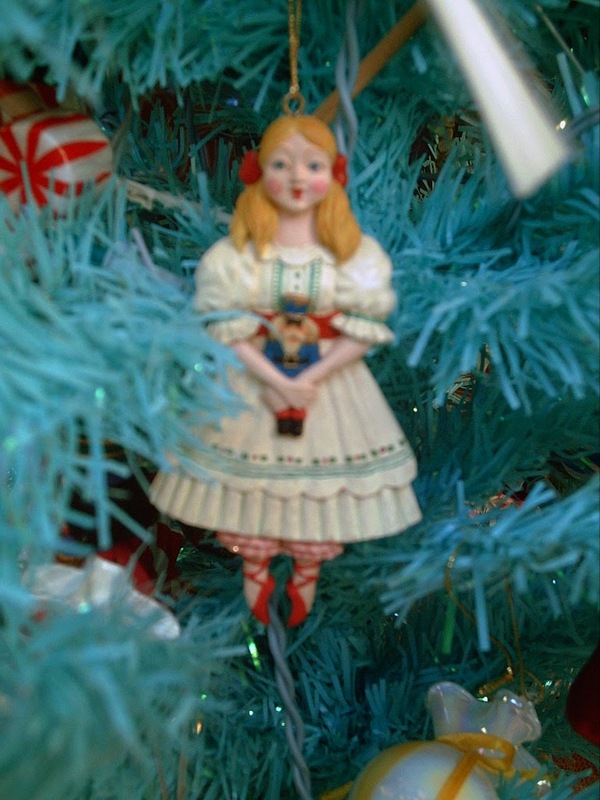 The 3rd plate is of Clara or Marie holding her Nutcracker. The plate stacking was so enjoyable to do. I have a square wood charger resting on the gold pin tuck table cloth. On top of that charger I have another charger that is gold and is glass. 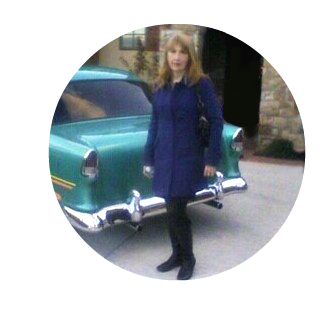 A white dinner plate next and then a blue with white snowflake doily that I felt would bring all the blues together. 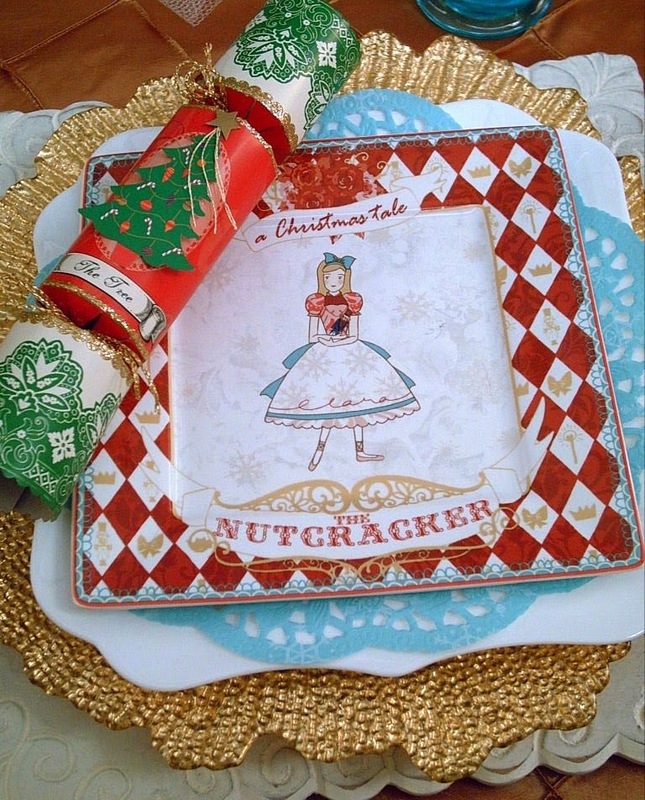 With the adorable china Nutcracker plate on top. 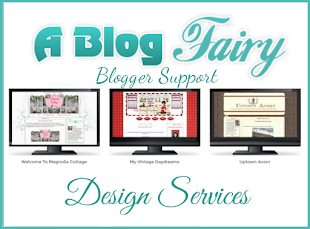 I don't know if you noticed but I have alternated square and round plates shapes together. Starting with square, then round, then square, round again and ending with square. 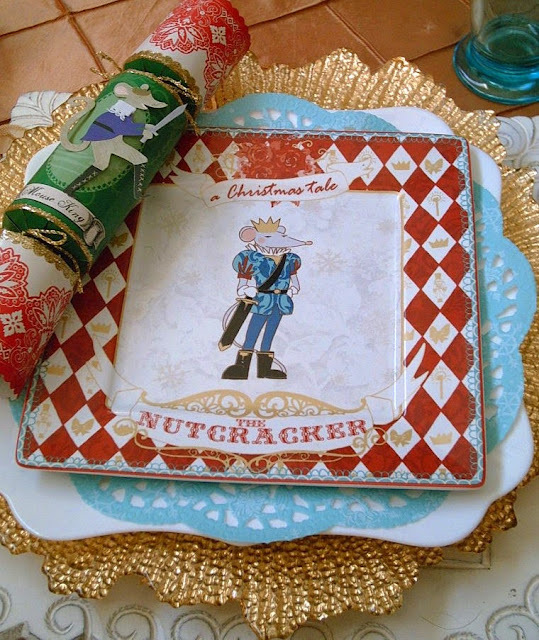 Last but not least my 4th Nutcracker plate is of the Mouse King himself. He also has a Christmas Cracker placed on his plate that is of the Mouse King. A closeup below of the Sugar Plum Fairy. She looks so much like the Nutcracker plate in my first photo. 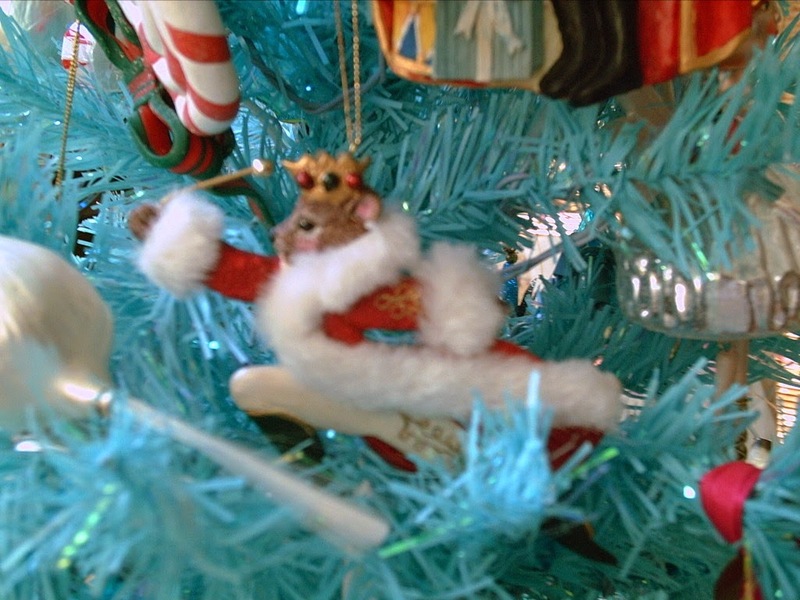 Love this Mouse King ornament. 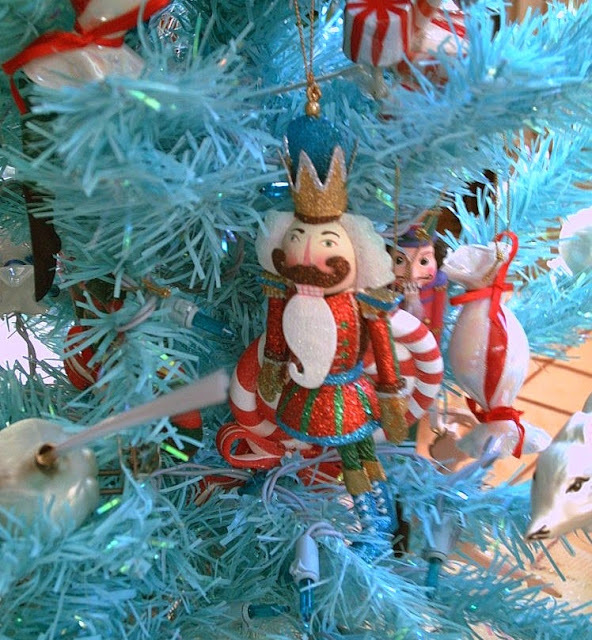 He is prepared for battle with the Nutcracker. Clara lovingly holding her Nutcracker. I couldn't forget the mice! 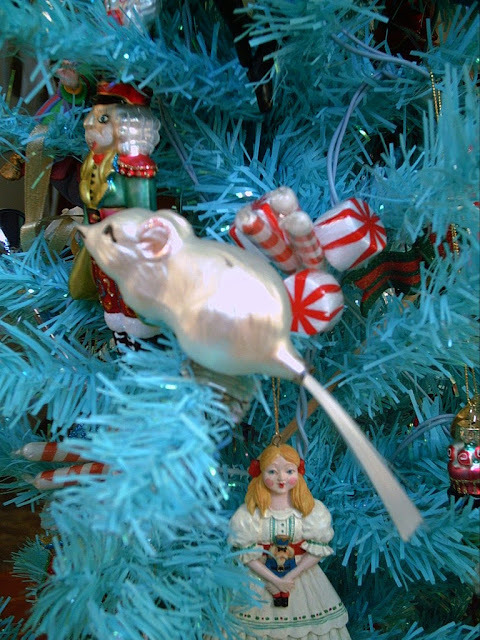 There are several on the tree. 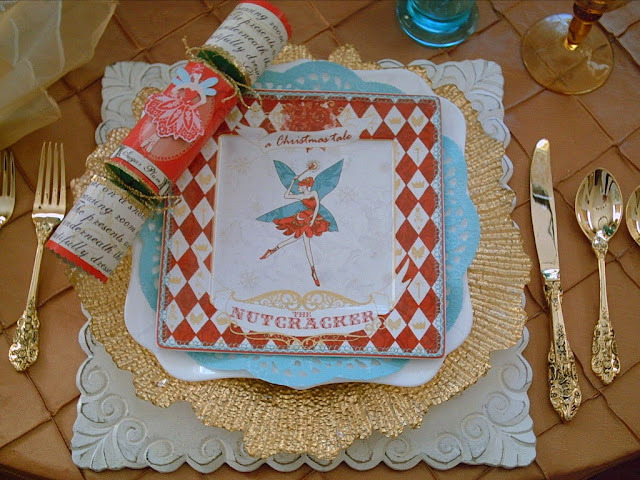 Each place setting has a different glittered Nutcracker used for a napkin ring. I just took ornaments and fed the napkins through the hanging cord. Of course you have to have a Sugar Plum Cake. I made this cake to match the colors of the Cake Stand and the Tree. Loaded with sugar plums. I have been waiting for a use for this cake stand from the discontinued Martha Stewart by Mail Catalog. You never know how you can use your items in the future. 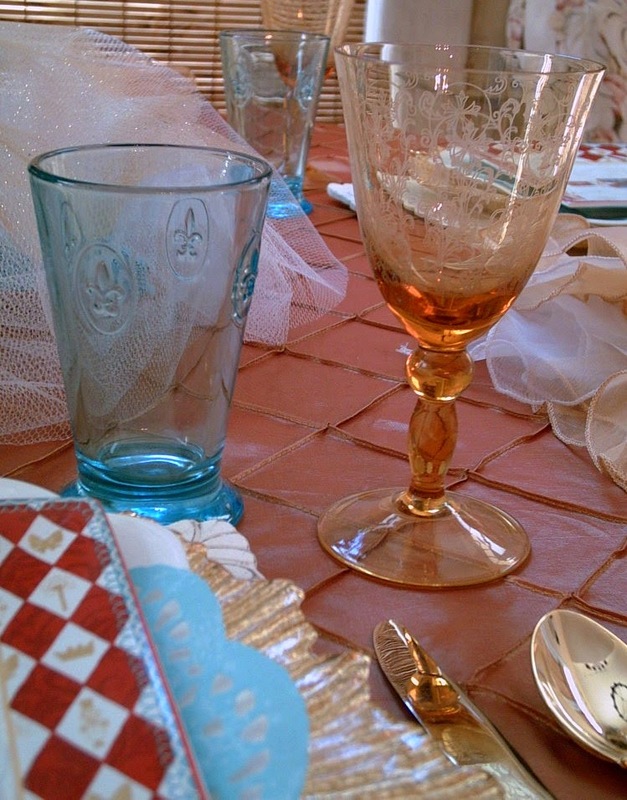 Glassware are in my collection. Purchased again at a Pottery Barn/Williams Sonoma Warehouse Sale. Originally kind of pricey, especially the gold goblet. I really got a GREAT BUY at only a dollar each. 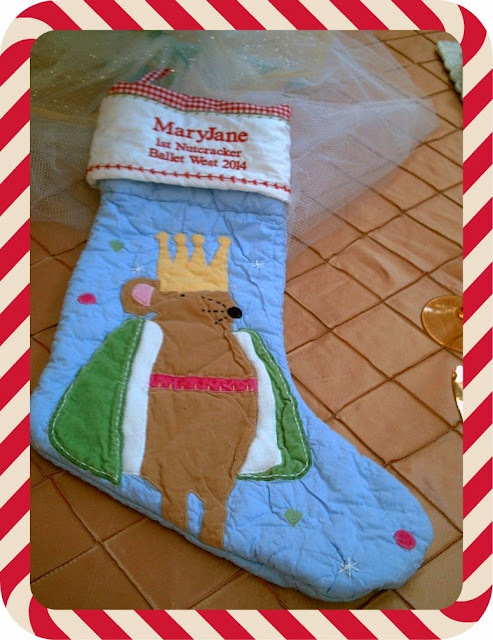 A few years ago Pottery Barn Kids did a line of Christmas Stockings that were The Nutcracker Theme. I bought some for a dollar each at "The Warehouse" sale. They were new but monogrammed. I removed the monogram and had them re-monogrammed. 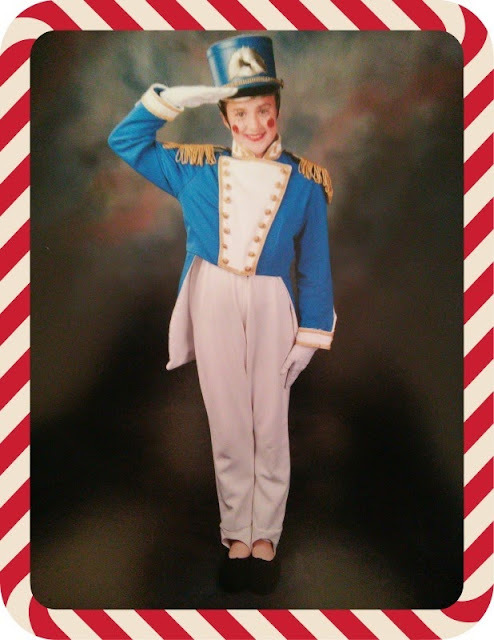 My cute granddaughter in her Nutcracker costume. Although not a "Nutcracker photo" my son and daughter-in-law posing in a Ballet pose for this picture. We love Ballet at our house! Please Feel Free to Make A Comment Below. I would love it! Sharing with Between Naps on the Porch Tablescape Thursday. A few of my sources for the items are as follows. White wood charger Pier One. Gold glass charger Z Gallerie. White dinner plate Tai Pan Trading. Blue doily Dollar Tree. 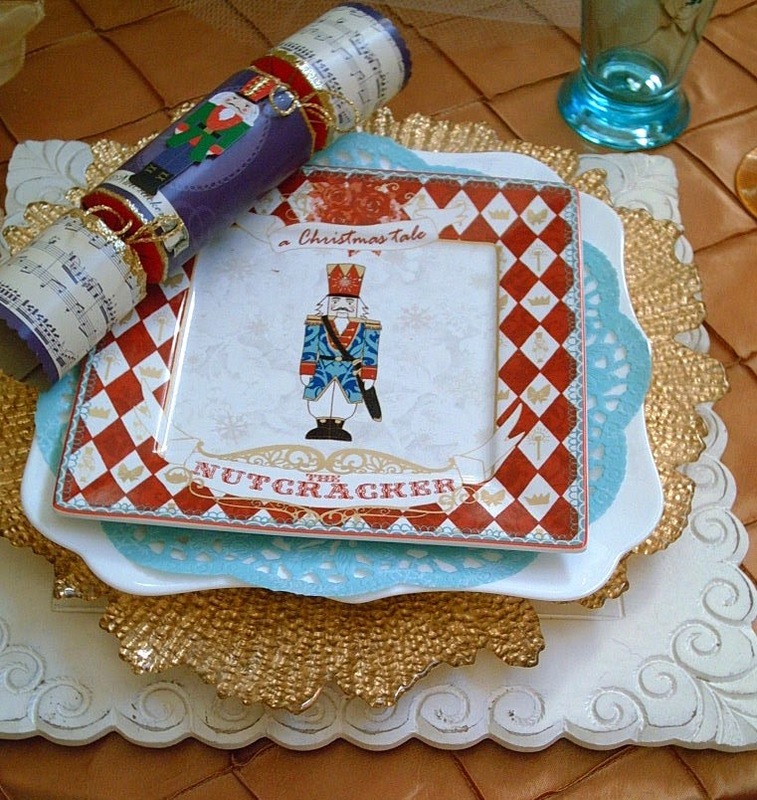 Nutcracker plates Ebay. 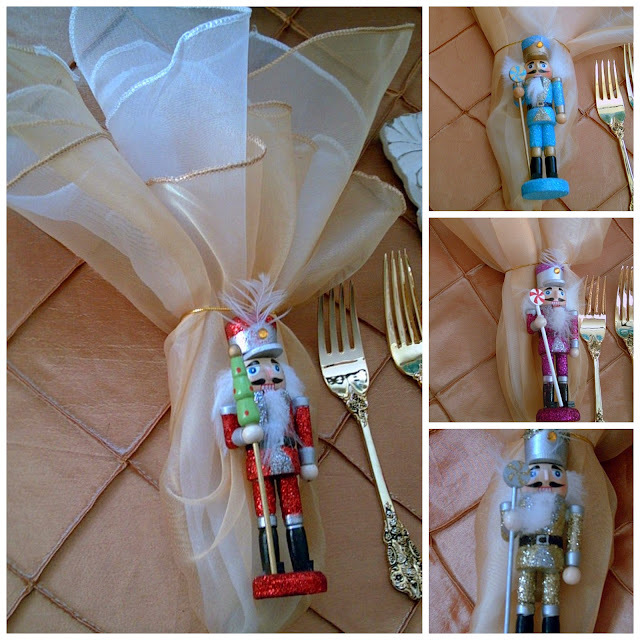 Nutcracker napkin rings (really ornaments) World Market. 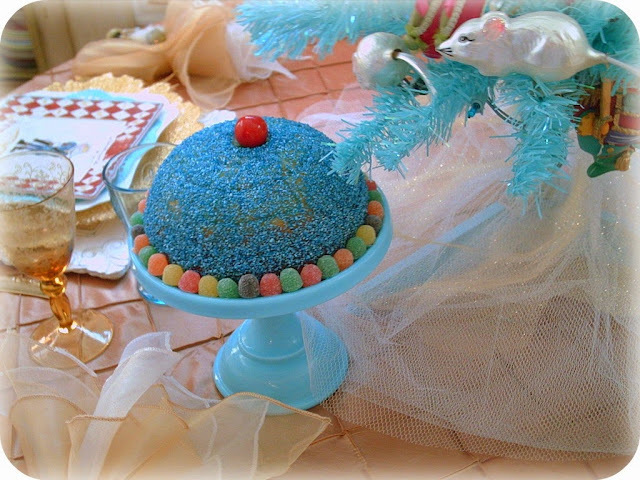 Blue Cake Pedestal from the Martha By Mail Catalog for Living. Christmas Tree from Big Lots. I love the crackers! They'd be so fun to open with family or other party-goers. You really are mindful of bringing the table together aesthetically. It's a visual experience! Lovely table...you did great matching the poppers to the plates! Love the choice of plates, too. I did search for "Nutcracker" plates on Ebay. The brand is 222 Fifth.